Fall is the perfect time for reading. The following best-selling survival-themed books are a hit amongst boys of all ages. If you are a homeschooling family, you can even incorporate some of these into your lesson plan! Would you know what to do if you met a bear in the woods? How exactly do you light a fire in the rain? What should you do if stranded in shark-infested waters? Get the answer to these and many more questions in this no-nonsense guide to survival training and wilderness adventure. Each page has detailed illustrations, specific and step-by-step instructions, and useful tips. Includes information on survival basics, camp craft, navigation, shelters, food, first aid, rescue and more! 320 pages. This book covers it all. 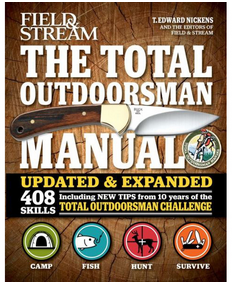 The 408 pages cover the essential skills every outdoorsman should have. You’ll learn how to hunt better, fish smarter, survive anything, and camp anywhere. Outdoorsmen of EVERY age will love this book. Now this isn’t a “survival” book as judged by the typical standards. However, we include it here because there are many valuable life-lessons that teenage boys can learn and benefit from. • What are the most important skills to learn if you really want to achieve your maximum potential? • How do you keep going when all the odds are stacked against you? • How can you motivate a team to follow you in spite of apparent risks? Teach your children the seven priorities of survival. 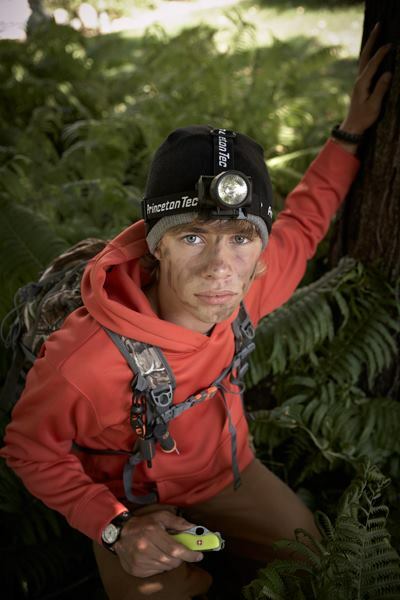 If you are the parent of a boy scout, you are probably familiar with the seven priorities for wilderness survival. 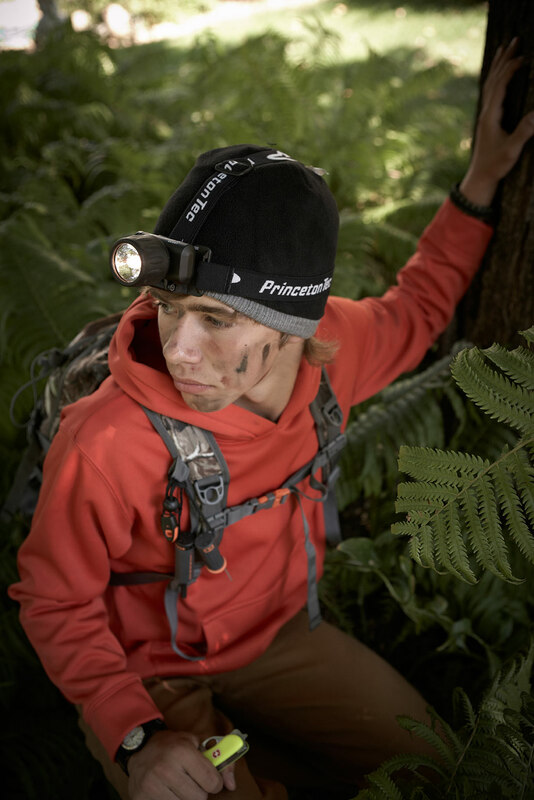 The Boys Scouts of America requires that scouts attempting to earn their Wilderness Survival Merit Badge know and understand these priorities. The priorities are easy to understand, are built on common sense, and can easily be taught to young people whether they are boy scouts or not. Listed in order of importance, these priorities are: keep a positive mental attitude, first aid, shelter, fire, signaling, water & food. Keep a Positive Mental Attitude: If they panic and lose control, they are likely to make the situation worse. The best thing to do is to adopt the S.T.O.P. rule. Stop, think, observe, plan. Explain this concept to your children as it is a good one and can be used during any crisis situation. First aid: If anyone in the group is critically injured, first aid becomes the next priority. Teaching children basic first aid is a crucial wilderness survival skill. Topics to cover would be minor health issues including insect bites, blisters, dehydration, hypothermia, cuts, scrapes, and bruises. You can also cover larger health problems such as broken bones and snake bites. The Red Cross is an excellent resource for first aid training. JM Cremp’s also sells a waterproof Pocket Guide to First Aid that is an excellent addition to any backpack. Shelter: The third priority is to find or create shelter. The ability to protect yourself from the elements is crucial in any survival situation regardless of the weather. The next time you are out with your children, ask them how they would find or build shelter. What materials would they use? How would they build it? You can learn more about finding shelter in the book Shelters, Shacks, and Shanties: The Classic Guide to Building Wilderness Shelters. Fire: The ability to build a fire in a survival situation is critical. Fire provides warmth, can cook food, purify water, can be used as a signal device, and will most definitely boost morale. Show your kids how to build a proper fire in the woods and you will teach them a skill that will last a lifetime. Signaling: The most effective tools for signaling are a signal whistle and a small mirror. Teach them that three blows on the whistle means “help”. The mirror can be used to signal aircraft, helicopters, or people far away. Water: A human being can survive approximately three days without water. Teach your children how to find a clean water source, how to purify water, and how to draw moisture from the ground. The book, Essential Survival Skills, is an excellent resource for all of the topics discussed here including how to procure safe drinking water. Food: People can go several weeks without food in survival conditions. Knowing what plants to eat in the wilderness requires some more extensive training. The book, The Complete Guide to Edible Wild Plants is an excellent learning resource. Also, if you are a family that hunts and fishes, use that hunting and fishing time to discuss procuring food in a survival situation. As always, JM Cremp’s is an excellent resource for survival gear for kids and adults of all ages. Building your own basic survival kit is easy and fun to do. It is the perfect addition to your pack when you’re camping, fishing, hiking or hunting. By making your kit ahead of time, you can take it with you whenever your adventure leads you into the wilderness. The Bear Grylls Basic Survival Kit has all the essentials that a good survival kit should have. There are a couple of things to keep in mind. 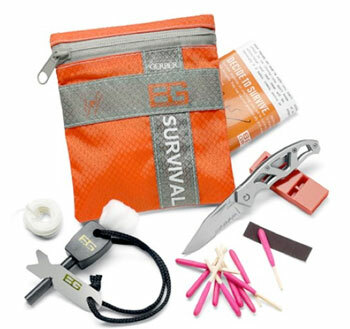 A survival kit such as this one is only useful if you know how to use the items in it. So be sure to practice proper use of the items with your family before you head out. Also, JM Cremp’s carries some excellent survival books that give instruction and tips for survival situations. 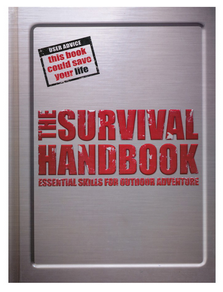 Two of our favorites are The Ultimate Survival Manual and Essential Survival Skills. Remember: This is a basic starter list, so you can add or take away whatever you need to customize your pack for your situation. JM Cremps carries the Gerber Bear Grylls Survivial Kit. This survival kit is small and compact and will fit in a large jacket pocket. You can use it as is or build upon it to include more options for your situation. Bear Grylls once said, “I hang out all the time with kids and young scouts and I never meet kids who don’t want adventure.” As a childhood adventurer himself, Bear knows what he is talking about. In his latest book, he discusses the life lessons learned from his epic adventures and the effect that his training has had on his entire life. When we discuss “survival skills” and “survival training”, we are usually referring to the mechanics involved in wilderness survival situations. Survival trainees need to know how to build a fire in less-than-perfect conditions, what supplies should always be in their pack, how to find or build a shelter, and on and on. The amount of books, websites, and videos devoted to survival skills training is growing every day. Of course these are the nuts and bolts necessary to stay safe in less than optimal conditions, and the benefits derived from possessing these skills can be lifesaving. However, there is one intangible aspect to teaching your children survival skills that is rarely discussed, and it is equally as important. Yes, they may come home dirty, but the boost to their self-esteem, confidence, and mental stature is worth a bit of dirty laundry. As a mom whose boys have learned and practiced survival skills for several years, I’ve seen firsthand their intellectual and personality growth during this process. The boost to their self-esteem and confidence has been no small thing. In the rare times that their skills have been put to the test, it has warmed this mother’s heart to see my boys step up to the plate. Very recently (as in during the middle of writing this article) my boys were splitting and stacking wood when a split log crushed my son’s finger breaking it and opening it to the bone. Without panicking, the boys cleaned it, stabilized it and wrapped it as best they could. When they arrived home, marched into my office, and calmly shoved the mangled appendage under my nose, I will admit that it was mom who panicked a bit. However, my injured son calmly assured me that it was cleaned, stabilized, and likely broken, so I bit back my motherly “OH MY POOR BABY” response, grabbed my purse, and drove him to the emergency room for some proper medical attention. When I started to write this article, I didn’t except to prove my point with a real world example mid-article, but I guess that truth IS stranger than fiction! Without having to experience this example yourself, keep it mind the next time your kids show an interest in camping out, scouting, learning survival skills or simply starting a fire with a piece of flint. It may be worth considering the long-term benefits. Then, grab the fire extinguisher, make sure the first aid kit is up-to-date, and indulge them in their adventurous spirit a little bit. There may be more to be gained in such an endeavor than is readily apparent. In hindsight, I can say that my calm “we’ve-got-the-situation-in-control-mom-so-don’t-panic” sons did a good job in a less than optimal situation. Now if I can just find a way keep the broken-finger kid occupied and still long enough to let that finger heal…. 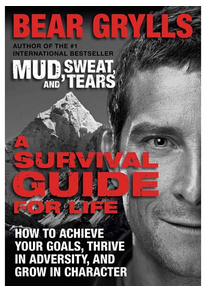 You can read more about Bear Grylls new book, Bear Grylls: A Survival Guide for Life on our website. This latest book focuses on the life lessons Bear has learned as an extreme adventurer and survivalist. At jmcremps.com you can also find all types of survival gear, survival books, and resources for parents. If you love the outdoors and love to spend time exploring the woods, then it is wise to learn some basic wilderness survival skills. No one expects to ever be in a survival situation, but knowing how to navigate with a compass can be a real lifesaver. A basic compass (even when used without a map) can help to guide you in the right direction and bring you home safely. 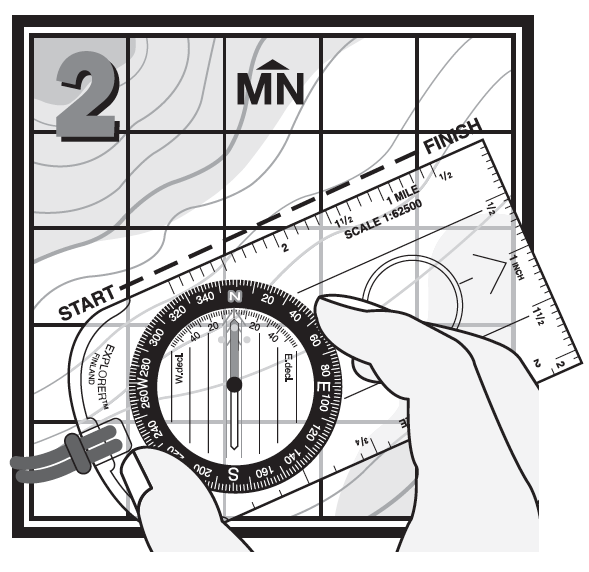 Learning to properly use a compass is easy, but as with most things, practice makes perfect. 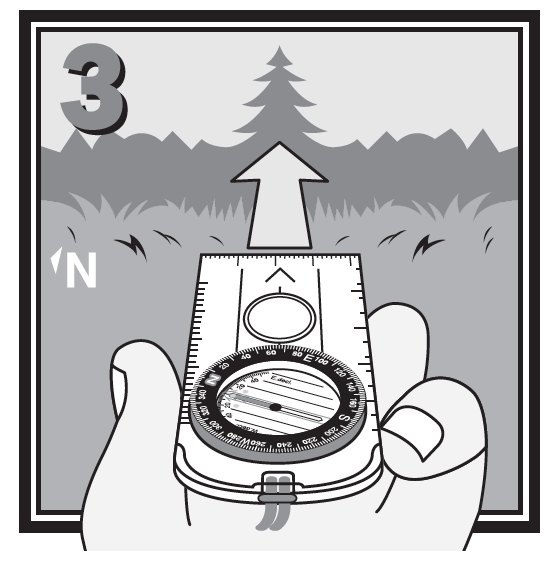 The next time you are out hunting, hiking, or playing in the woods with friends, bring a compass and practice the navigation techniques below. To make it as easy as possible, begin your practice in an area you are already familiar with. Try navigating both with and without a map so you can learn both techniques. Familiarize yourself with the parts of your compass before you head out so the directions below make sense to you. Pretty soon, you’ll be a navigational genius! 1. Select a landmark along the route you want to travel. Hold the compass level and point the Direction of Travel Arrow at the landmark. 2. Find your heading to the landmark by turning the compass dial until the “N” aligns with the red end of the Needle. Read your heading in degrees at the Index Line. 3. Keep the Needle aligned with the “N”; look up; sight on your landmark and walk to it. Repeat this procedure until you reach your destination. STEP 1. 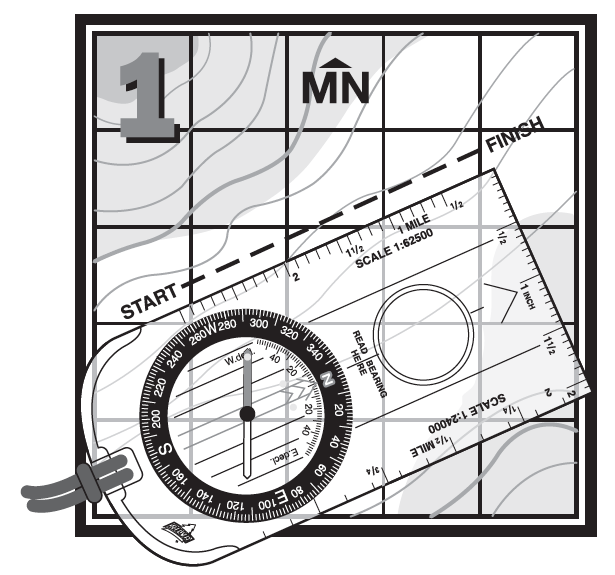 Place your compass on the area map with the Base Plate edge connecting where you are with where you want to go. 2. Set the compass heading by turning the compass Dial until the “N” on your compass aligns with Magnetic North on the map. 3. Remove the compass from the map and hold it level in front of you with the Direction of Travel Arrow pointing straight ahead. Turn your body until the red end of the Needle is directly over the Orienting Arrow, pointing to the “N” on the dial. That’s it! The Direction of Travel Arrow now points precisely to your destination. Look up, sight on a landmark and walk to it. Repeat this procedure until you reach your destination. The techniques and instructions listed above are included FREE with the purchase of any Silva compass. JM Cremps carries several different compass models, but one of our favorites is the Silva Guide 426 Model Compass. It is durable, accurate, and is a proven favorite amongst outdoorsmen, geologists, and foresters. It is also the perfect addition to the list of items in our original Survival Basics for your Survival Bag.